Yes, we have our very own app at the Play Store and trust me when I say that the Beebom app is the only app you need for all the technology related updates. First of all, the app brings you all the news from the tech world in a crisp format, so that you can read in a jiffy. However, if you are someone who loves reading the full story, you can just tap on the “Read More” button the bottom bar to get a detailed story of the same news. Plus, there’s the much loved “Trending Today” section and some really cool gestures. You can swipe left and right to get through different news items and swipe down to go to the home screen. These gestures are super handy. With the new Beebom app v2.0, you not only get news stories, but also exclusive portrait videos, which are crisp and look really good. There are gestures here as well. Apart from the really cool videos, the app features a “Dark Mode” option, which is something a lot of people love. There’s a lot more, like the ability to bookmark articles, like articles, etc., and all of that in an ad-free Material Design experience. Plus, the app is free. Honestly, if you are an avid reader of all things tech, you should go ahead and install the Beebom app. The folks at News Republic, who created one of the most popular news apps won the hearts of tech enthusiasts when they launched a tech news only app called Appy Geek. Although I think they could have done better while choosing the name of the app, there’s nothing else I would want to change about it. The app has a beautiful Dark UI with even better animations. The animations are fluid and put even the best-designed apps to shame. The best part about this app is that it comes pre-subscribed to various technology websites allowing you to start using the app as soon as you install it. Of course, you get the ability to manage your subscriptions in the settings menu so that you can customise the feed as per your liking. 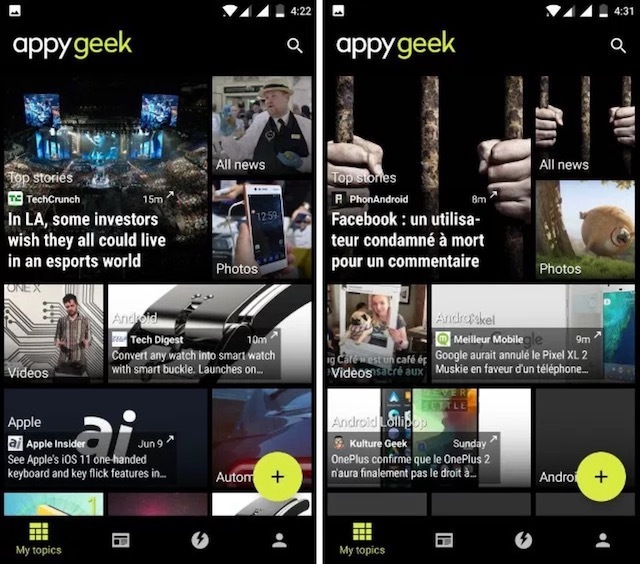 Whether you are looking for short news or looking for long in-depth articles, Appy Geek has got you covered. 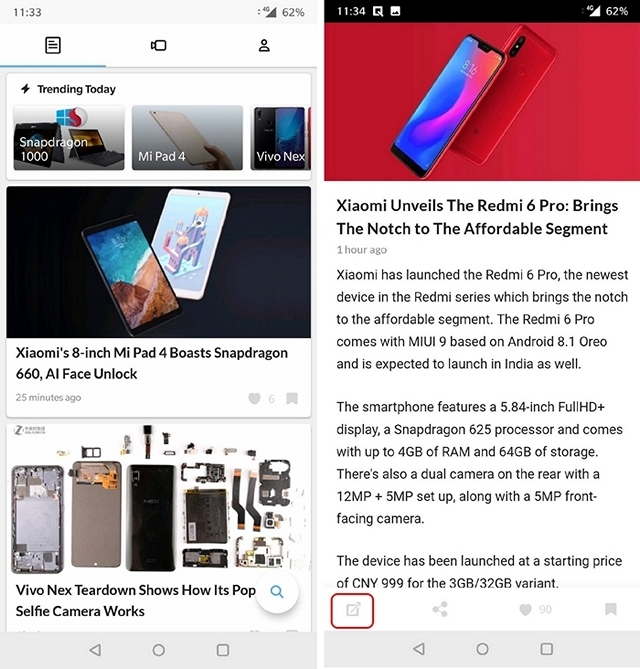 While you can find the news articles in the home section of the app, its digest section features editorial articles covering reviews of products and gadgets. One other cool feature is that you can post a comment to all its sources websites from right within the app itself. Also, apart from English, it also supports various regional languages such as Espanol, French, Spanish and Chinese. You can either use the app for free with featured ads or you can buy the Pro version to get rid of them. 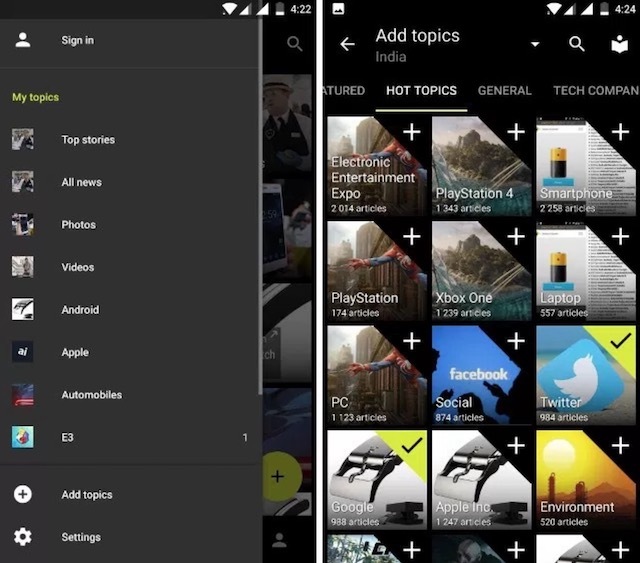 Unlike Flipboard, Feedly is a proper RSS feed reader which makes it really simple to subscribe to your favourite technology sources. When you launch the app, you can just select the Tech option and you will get a list of popular tech news publishers you can subscribe to. If you cannot find your favourite source in the list, just search for them and add them to the list. One of my favourite Feedly features is that you can create several personal feeds. This allows me to create separate spaces for different categories of articles. For example, I have created different feeds for iOS, Android, and Windows articles. Other cool features include a dark mode, auto mark read feature, third-party read it later apps support (Pocket, Evernote, Instapaper, and OneNote) and social media sharing options among others. 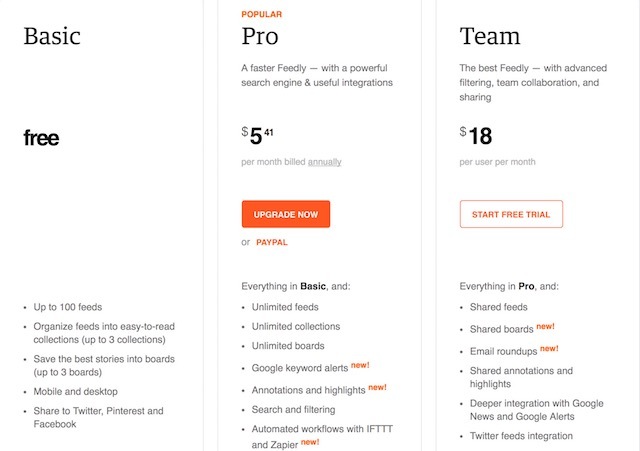 My only major gripe with Feedly has been its pricing strategy. It follows a subscription model and has applied it in such a way that you can never get away with using only the free version. Also, the pricing is a little bit on the higher side. You can read all about it by visiting this link. If you can get over this fact, you will enjoy using the app. 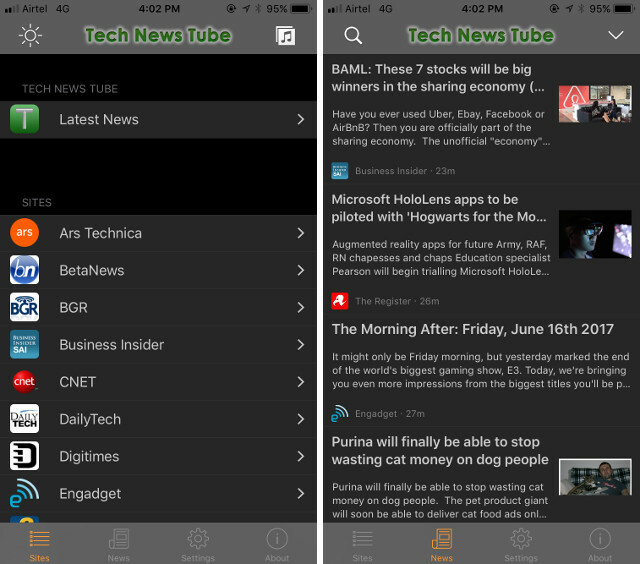 Tech News Tube is a simple app which lets you subscribe to different websites and deliver their content through its app. It is a pretty basic app but does well when it comes to extracting the feeds. 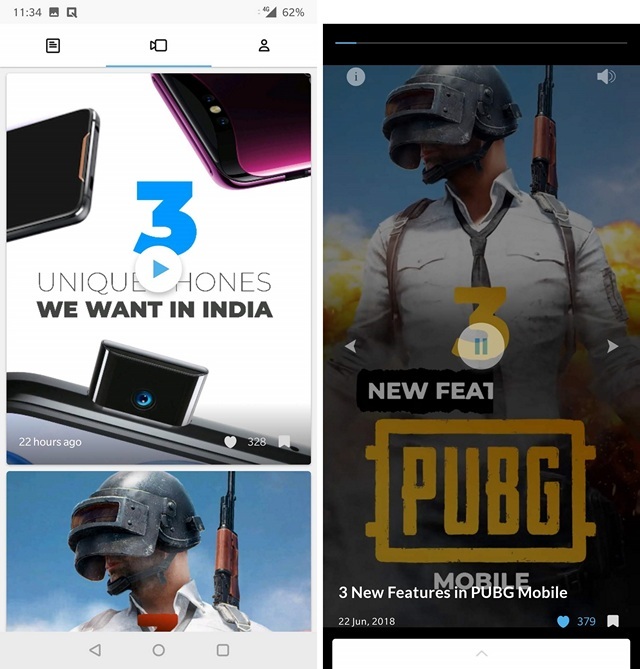 One of the unique features of the app is that not only it shows you the written content of the articles, it also shows all the audio content published on the websites you follow. 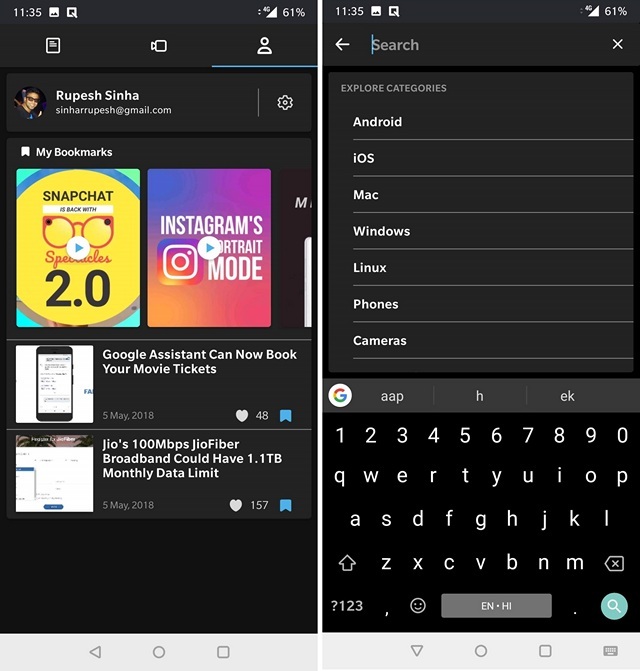 It also has an inbuilt dark mode. However, its strengths end here. The biggest problem with this app is that when you tap on the article, it redirects you to the article website. There is no inbuilt parsing feature, which is available in apps like Feedly. Also, it is heavy on ads and cost a lot more than its worth to remove the ads. It’s an app which is better used as an information aggregator and not a reader. 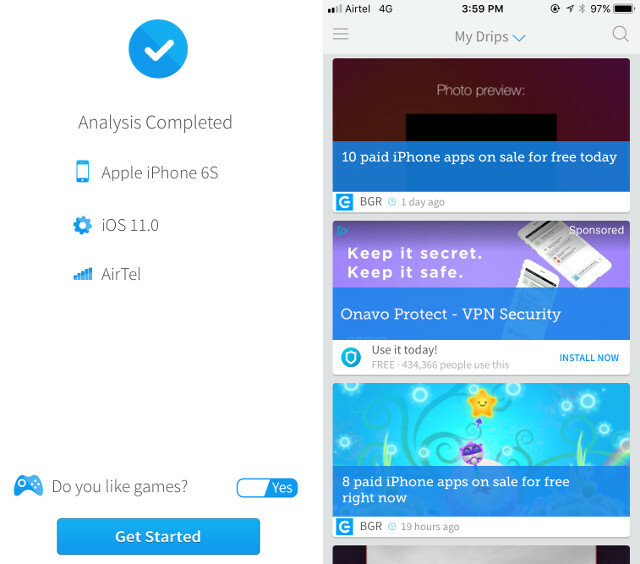 Drippler will not strictly fall into the tech news app category, but still, we have included it in our list because it serves a very specific purpose and we think it will be helpful for our readers. While it does cover the latest news and trends in the technology industry, that’s not its primary function. The app’s main focus is to deliver you tips and tricks related to your mobile device, so that you can get the most out of it. I was surprised to see how quickly it recognised my phone’s model, its OS version and the network provider I am using. The app is easy to use but the UI does feel a little crowded. You should give this one a try if you like to discover new tips and tricks for your device. There’s no harm as it is completely free. Technology is an ever-changing landscape. It’s hard to keep up with everything new happening in the world of technology. I would even venture out to say that it is impossible to stay up to date on everything. But, we can try to stay up to date on the tech that mattes most to us. 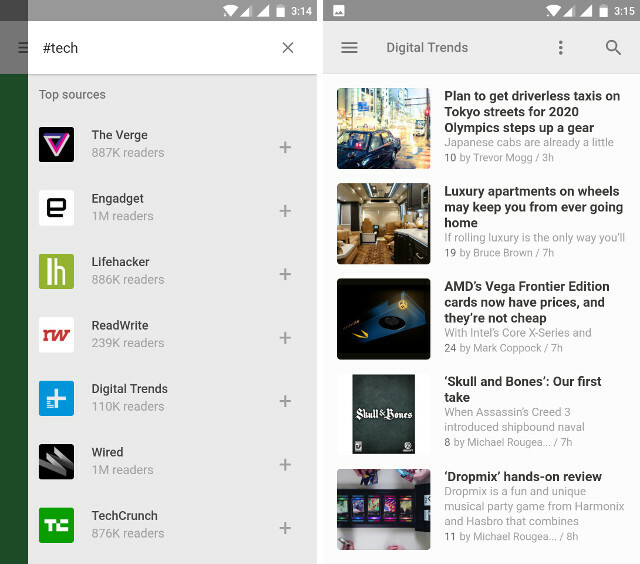 Download these great tech news apps and customize them to receive the updates you want to see in your feed. So, use these apps and tell us which is your favourite. Do tell us about any other app which you are currently enjoying, we will love to try them out.